Trade shows are an effective way to market, promote and build your business. 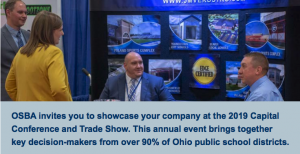 OSBA invites you to showcase your company at the 2019 Capital Conference and Trade Show. This annual event brings together key decision-makers from over 90% of Ohio public school districts. What do past exhibitors have to say? The OSBA Conference was a terrific conference for our organization, with plentiful connections to be made. 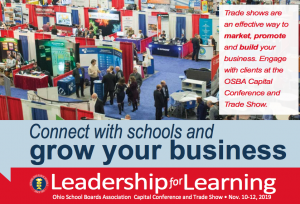 The communication from the OSBA team was outstanding which, combined with the direct access to the influential members of our target audience and the ease of load-in & load-out, will make this one a regular stop on our conference schedule.